When my husband had a brain stem stroke in 2014 a complete stranger tore my world apart by uttering the words “incompatible with life.” They said he probably wouldn’t live for 48 hours but he lived for over eight weeks and life was a roller coaster of emotions. The night he died we stayed with him not knowing whether to sit down, stand up, talk or be silent. It was hot, tense and emotional when into his room came a nurse with what she called Comfort Bags. Just small bags of toiletries that at that moment were worth their weight in gold. A year later I was at a bereavement support group at Salford Royal Hospital when they asked if people would make bags. I remembered them and when concern was raised about where the contents came from it seemed there was a shortage. I’m a member of Girlguiding Greater Manchester West and at that moment thought that this was something we could help with, never imagining what was to come and how it would change my life. “Great oaks from little acorns grow”, a common saying which could easily be applied to the collaboration between Salford Royal Bereavement and Donor support team and Girlguiding GMW that followed. Since that small idea more than 2750 bags have been donated in just two years, now supplying two hospitals and a hospice. Those little bags of hotel sized toiletries, comb, toothpaste, toothbrush, pen, notepad and other useful items do indeed bring comfort in stressful times. All our age groups from 5 to 95 enjoy taking part: – collecting, sewing, packing or writing gift cards. Originally for visitors who find they have to stay by a bedside overnight such has been the success of the scheme that they are now also available for emergency and homeless admissions. After the Manchester Arena attack we provided bags for families of the victims and injured. As a result all the hospitals we provide bags for in Greater Manchester had to be restocked and following an appeal we received large donations from British Airways, the Ladies Circle and many others. We soon had full stocks again which meant that following the tragedy at Grenfell Tower we were able to give bags to The Good Grief Trust for their work with families involved. How far this can go – who knows? 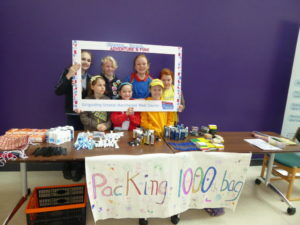 We hope other areas of Girlguiding will become involved in the scheme and so we have details on our county and region websites. If they do we would love to hear from them to answer that question for ourselves.